This week in English we have been reviewing some of our grammar knowledge and understanding. We learnt the difference between simple, compound and complex sentences. As well as this we can now use them in our work and identify which one is which. This in turn will improve our writing. 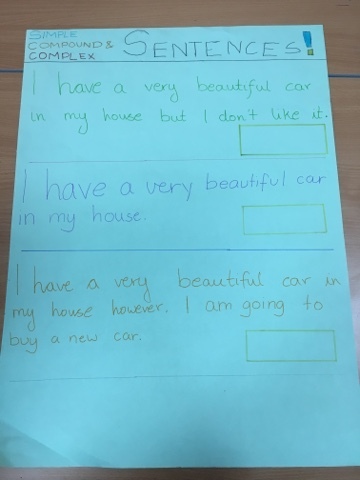 Also we learnt about main and subordinate clauses and how to use connectives. During Maths this week we have been converting mm, cm and m. This was a little bit tricky and we really had to use our understanding of multiplying and dividing by 10, 100 and 1000 to help us. Also we have been working on our arithmetic and timestables, as these are both very important. In Science this week we came up with our very own question that we wanted to investigate. Then we had to write and plan our own experiment. After that we carried our experiment out and wrote the results, and what we would change next time. We learnt a lot from doing our own investigation about electricity and felt like scientists.